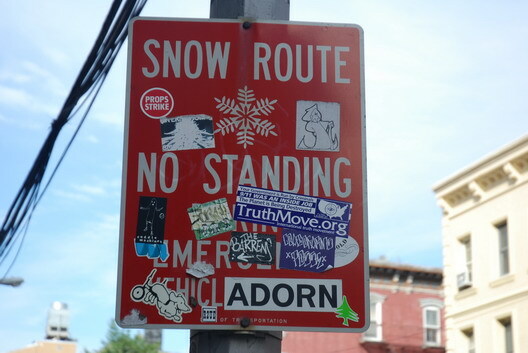 The Gowanus Lounge: Say What: Snow Route, Etc., Etc. Yes, it comes from Williamsburg. No, it's not the most tagged up sign we've ever seen, but we think it's rather nicely stickered, hence our decision to include it here. quick q: are you sending these pix (with location) to 311? Just asking, since I'd be royally pissed if I were towed beneath one of these signs. It's not that I couldn't decipher the regs given adequate time, but parking designations tend to communicate with the subconscious, and I can see myself, of a bleary morning, killing the ignition and wandering off, returning to find my car gone and my wallet $300 bux lighter.